The Parvovirus, Parvo, or Canine Parvovirus is a highly contagious and very serious viral infection that attacks a dog’s immune system. The Parvovirus is a very aggressive condition that swiftly divides the blood cells in the dog’s body, causing problems with the intestinal tract as well as severe damage to heart’s muscles, often resulting lifelong cardiac problems. Parvovirus is highly contagious and is passed from dog to dog via the faeces. While there are effective vaccinations against the virus, it is known to be extremely hardy.  It can live in almost any environment for months on end, including such places as shoes, carpets, food bowls and even timber floors. The resistant nature of the Parvovirus makes it a dangerous threat to any dog’s health. 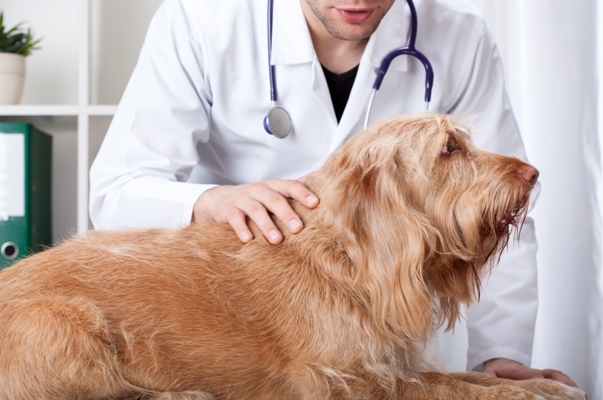 Although vaccines are effective, the mortality rate for dogs with the virus is very high at 91% for untreated cases. Unlike the Feline Immunodeficiency Virus found in cats, the Parvovirus is both extremely contagious and fast moving. The virus progresses very quickly with affected dogs showing symptoms within three to seven days. General sickness will overcome the animal very quickly. Within a week they will begin to vomit, show signs of lethargy and general weakness of the body. After a short period the body can go into shock and death will then follow. This will only occur in extreme cases, however, or if the disease has advanced to a point where effective treatment is no longer possible. Most animals will be vaccinated for the Parvovirus as puppies and will not be at risk of developing the condition. 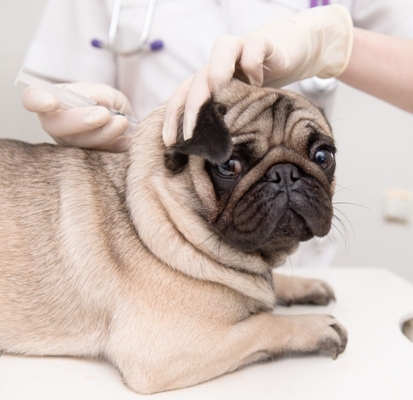 The Parvovirus is a very aggressive virus that attacks the dog’s nervous system, leaving them extremely vulnerable to all types of serious illnesses and conditions. The virus can cause very serious symptoms quickly. If you notice any of these signs in your dog, seek immediate medical care; the virus can cause serious damage to your dog’s health and even death within seven to ten days. Vomiting. When infected with the Parvovirus, dogs will vomit much more than what is considered usual. Keep an eye on your dog and, if they are vomiting often, it could be a sign of infection. Diarrhoea. Like vomiting, the dog will begin to produce liquid faeces in large amounts. The excrement will smell bad and there may be blood in the stool. Keep an eye on the colour and note the frequency with which your animal is passing waste. Dehydration. This comes naturally after your dog begins to suffer from diarrhoea and vomiting. Look for the tell-tale signs – increased water intake, lethargy and weakness in the body. Keep an eye on the gums and your dog’s eyes; if the eyes are sunken and the gums are dry or pale, severe dehydration could be a threat. Weight Loss. You will notice that your dog will begin to lose weight quickly. Diarrhoea and vomiting will cause the animal to lose condition and appetite will become severely reduced. Weakness. If your dog isn’t showing its usual enthusiasm for food or it is showing an intolerance for physical exercise, there’s a good chance the animal is seriously ill. Look out for the signs of physical weakness such as wobbly back legs, an inability to balance properly and general lethargy. 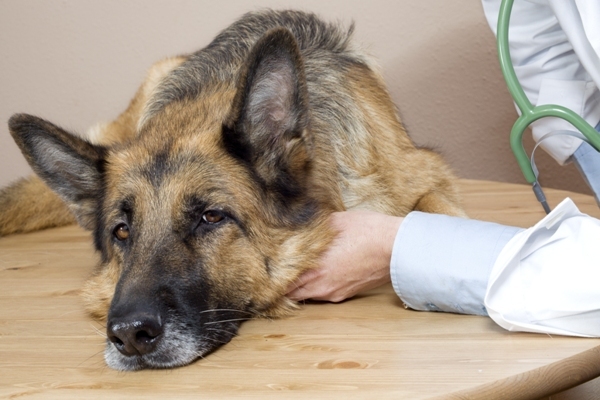 These symptoms are shared by a number of illnesses and conditions that affect dogs. Although it may not be the Parvovirus that is causing vomiting or lethargy, if you notice any of these signs, it’s always a good idea to seek medical attention as soon as possible. The Parvovirus acts quickly and can be fatal if left untreated. Diagnosis can be made by observing the symptoms listed above, paired with a number of laboratory tests. The blood is tested as well as the faeces of the affected animal because the symptoms may be caused by any number of conditions. Because of the nature of the virus, a blood count is required to determine whether the blood cells have been affected by the illness. The faecal testing is a bit hit-and-miss due the timing requirement of the testing. Even dogs that test positive to the virus in the blood test phase can test negative with regards to the faecal tests. Other tests that are commonly used to diagnose the virus include the polymerase chain reaction test (PCR) and electron microscopy. It’s important that early diagnosis takes place if the dog is to have a fair chance of survival. There is no cure for the Parvovirus. The main strategy for treatment is to curb the chance of further infections from harming the dog while the immune system is so weak. Hospitalisation is usually required, even if the diagnosis is made within the early stages, and a number of medications will be administered to correct the vomiting and diarrhoea. Intravenous fluids, anti-nausea medications and strong antibiotics are all commonplace when treating the Parvovirus. The dog will be kept in quarantine to avoid the spreading of the virus to other animals. Once the symptoms have been properly addressed and the dog is under close observations, the virus will be left to run its course. The observation phase will include further tests of the blood, urine and faecal matter. Tests will also be made to rule out the chance of a serious internal parasite infestation. Although veterinarians are well-equipped to fight the Parvovirus, it is an aggressive virus and the condition can cause death within days. In extreme cases, blood or plasma transfusions may be required. Once in the recovery process, the animal may begin to return to its usual self within two to three days. There is a Parvovirus vaccine that should be administered to all dogs at a young age; prevention is the key to avoiding Parvovirus infection.  The most up-to-date vaccine immunises dogs against even the newest strains of the virus and is very effective. Puppies should be immunised between the ages of 14 and 16 weeks. Some older dogs may not be immunised against the Parvovirus. Refer to your records or discuss your dog’s health history with your vet for advice. While there is an effective vaccination available, there are still a number of important steps you can take to avoid Parvovirus infections. If you have a young puppy that hasn’t yet been immunised against the virus, keep them away from veterinary clinic floors or boarding kennels until the vaccine is administered. If your dog is sick, even if they have been vaccinated, try to keep them away from public places, especially dog parks and other places where dogs will likely be present. When out for walks, collect and dispose of your dog’s waste as promptly as possible, sealing it in a plastic bag for sanitary reasons. Don’t allow your dog to come into contact with any strays or strange dogs. If you don’t know the owner or the dog, you certainly don’t know the animal’s vaccination history. The best way to prevent infection is to deny exposure. Because the virus can survive on nearly any surface for weeks on end and resistant to many disinfectants, clean suspect surfaces with household bleach. Find out more on Dog & Puppy Vaccination schedules & dog vaccination costs to help prevent Canine Parvovirus here. The Parvovirus can affect any dog breed. The chances of a vaccinated dog becoming infected are miniscule to none so make sure your dog has been immunised. The Parvovirus is resistant to many household disinfectants. The virus can survive on inanimate objects like floors, furniture or clothing for months on end. The best way to clean the areas that you suspect may host the virus is to use bleach. Only dogs can become infected with the Parvovirus. Cats and humans are immune to the disease, although it is suspected that the virus was originally passed to dogs by cats and then mutated to its current canine-only strains. The Parvovirus is especially aggressive and will cause severe illness and death within a matter of days if the dog is left untreated. 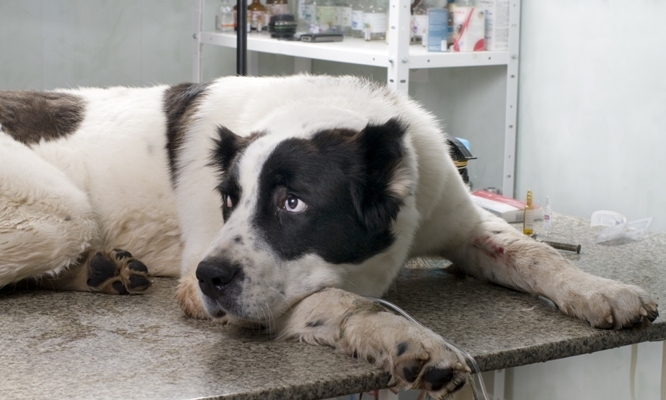 Even hospitalised animals have been known to die from the disease. The younger the dog infected, the greater the chance of fatality. Parvovirus isn’t the condition that will kill the dog. The virus causes the immune system to become severely weakened and a number of secondary infections will take hold. Dehydration, overwhelming infection and blood loss due to internal bleeding are the real dangers to a dog with the Parvovirus.